Every reader has a blogger they want to be best friends with - Em is mine. This girl is down-to-earth and genuinely lovely, which you realise whilst reading her posts. 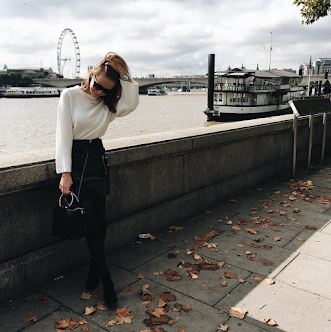 Em is definitely a blogger that I am inspired by so it's exciting to have her on my blog! Em Sheldon; Beauty, Fashion and Lifestyle Blogger. I think this is very difficult but I honestly believe in going into a changing room and just trying on everything - including things you'd never usually wear because then you can really work out what works for you. My onesie. Or a slinky, tight black dress for a dinner date with red lipstick. Zara, Forever 21 and Topshop. What jewellery do you wear everyday? I only wear the jewellery from my online shop Lvndr and my Pandora ring from my boyfriend. I hope it still stays like Mollie King. As I grow I'd love to dress like Victoria Beckham or Kate Middleton. Sunglasses from Ray-Ban Club Masters, Co-ord from Motel Rocks, Leather Jacket from Dorothy Perkins, Boots from All Saints and a Headband from Lvndr. Be sure to have a look at Em's Blog - Emstalk!